Like hiring great employees, finding great vendors can be tricky. Simplify Compliance is here to help! Not sure where to start in your search for an outside vendor? Selecting the best vendors that match your company's performance characteristics can be a challenge. Every vendor will have its strengths and weaknesses, and choosing the right one is a critical task in order to meet your organization’s goals and milestones on a consistent basis. 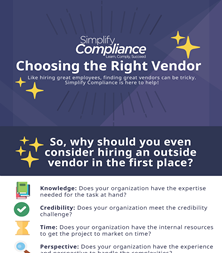 Download your copy now of our infographic "Choosing the Right Vendor" to access some helpful guidelines for selecting a vendor you can trust and that understands your organization’s needs.